You are at:Home»Afghanistan»How long will Regional Command-Southwest in Afghanistan survive? Month by month, it increasingly looks like it could be a matter of time before the two-star Marine headquarters in southwestern Afghanistan ceases to exist. Regional Command-Southwest, as it is known, was established in 2010 as the U.S. rapidly expanded military operations in Afghanistan, surging thousands of troops there. The Marine Corps was among the first involved in that surge, seeing its footprint grow in Helmand province from about 11,000 in 2009 to 20,000 the following summer. Maj. Gen. Richard Mills took command that spring of the newly formed RC-Southwest, which split off from the neighboring two star-headquarters in Kandahar province, RC-South. Already, the Corps is shifting in the other direction. 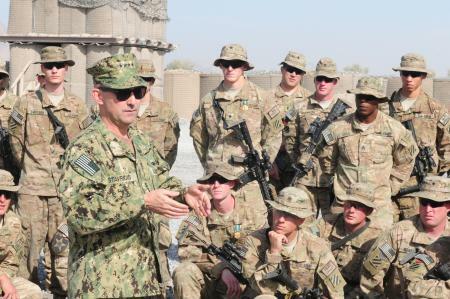 Currently, Maj. Gen. Lee Miller, commander of II Marine Expeditionary Force (Forward), leads coalition military operations in southwestern Afghanistan. Marine officials say he will be replaced early next year at Camp Leatherneck by Brig. Gen. Daniel Yoo, who will deploy with a smaller headquarters known as MAGTF-14. Why 15,000 troops? The post-2014 mission needs to be spread across Afghanistan, with centers in each of the regional commands — north (Mazar-e-Sharif), west (Herat), south (Kandahar), and east (Bagram). There will have to be smaller centers in some of those regions as well, and a reliable ability to protect our own people and potentially provide some in-extremis support to the Afghan National Security Forces (ANSF). All told, that will require 15,000 troops, still quite low compared with the 130,000 we had on the ground as recently as two years ago. This level would also provide critical mentoring and training in the areas in which the ANSF are still developing — logistics, intelligence, medical support, close air support, and so forth. Notably missing from that list of regional commands is RC-Southwest — which means perhaps it’s time to examine what happened as the war expanded. When the surge was announced by President Obama in 2009, the Corps had a one-star Marine Expeditionary Brigade in Helmand commanded by then-Brig. Gen. Larry Nicholson, with headquarters at the newly built Camp Leatherneck. The service was preparing to replace 2nd MEB through regularly scheduled deployment rotations with a similar unit from Camp Pendleton, Calif., led by then-Brig. Gen. Joseph Osterman. Instead, the Corps deployed I MEF (Fwd. ), Osterman told me in an interview in 2009. The move came as the Corps advocated for overseeing security in its own portion of the country, so it could operate in its traditional fashion as a Marine air-ground task force with its own organic air, logistics and combat forces. Marine commanders in Afghanistan already have acknowledged they are planning to draw down to 4,400 troops in Helmand by early 2014 — and that’s if Obama’s yet-to-be-announced decision doesn’t dictate less. If that’s the case, how long will it be necessary to have a separate headquarters with a general officer in Helmand?